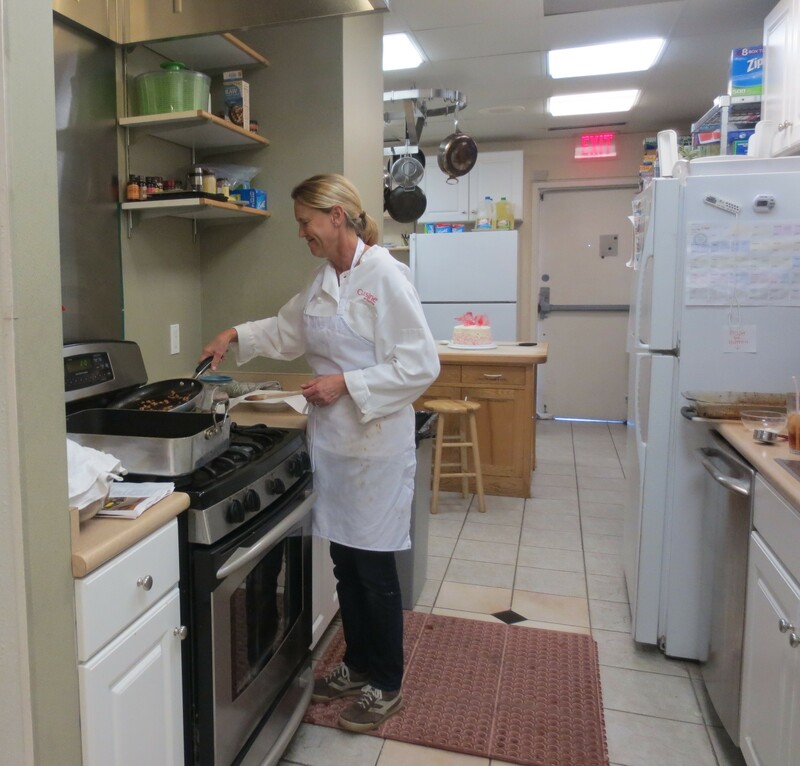 VISITED SPAM MUSEUM – NOW, COOKING WITH SPAM. After a visit to the Spam Museum in Austin, Minnesota and purchasing 2 cans of Spam to play with, this is the first offering I made. I was prepared to probably like it because all the ingredients I do like; I was not prepared to like it as well and Roy and I did. 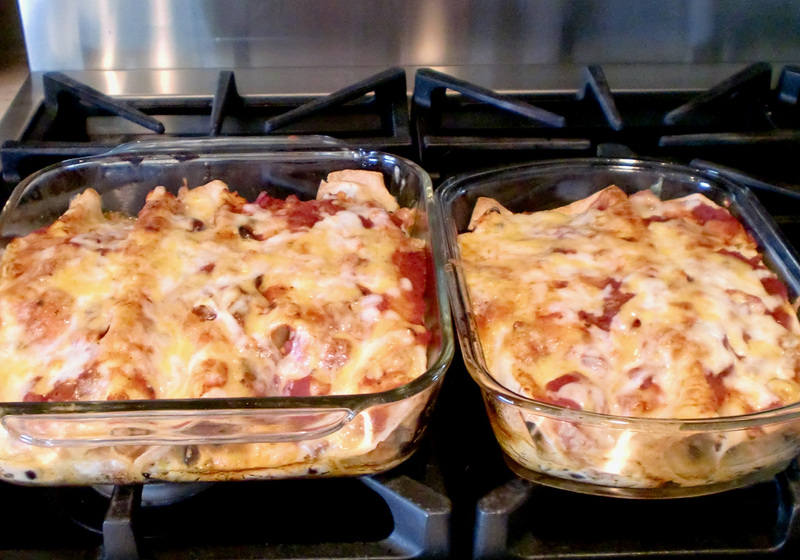 Silly dish – straight out of the 50s or 60s! But, we’ll do it again – it’s a perfect on-the-road food, especially on a travel day. 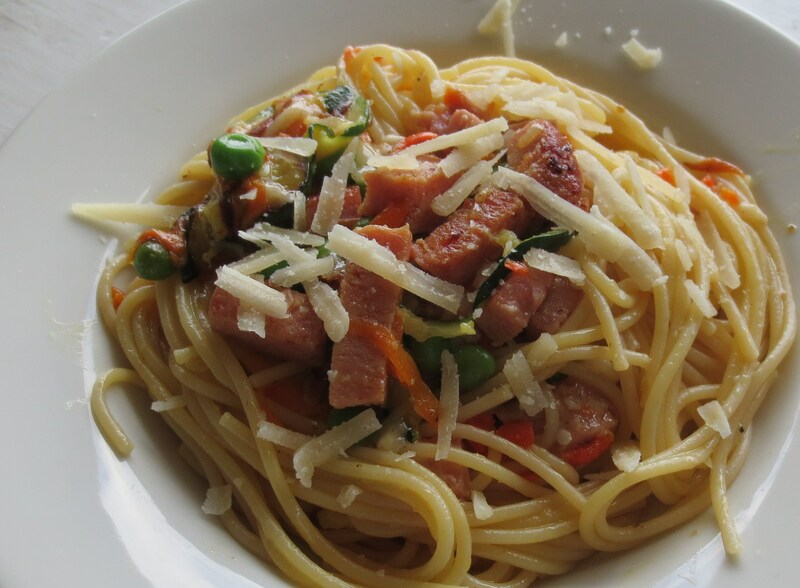 In a mixing bowl, combine the Spam, cheese, eggs and mayonnaise. Split and butter buns, and place on lightly greased baking sheet. Fill buns with the Spam mixture and place in oven until cheese melts and the edges of buns start to brown. Serve at once. 4 to 6 servings. They were all good – give Spam a try, if you haven’t. 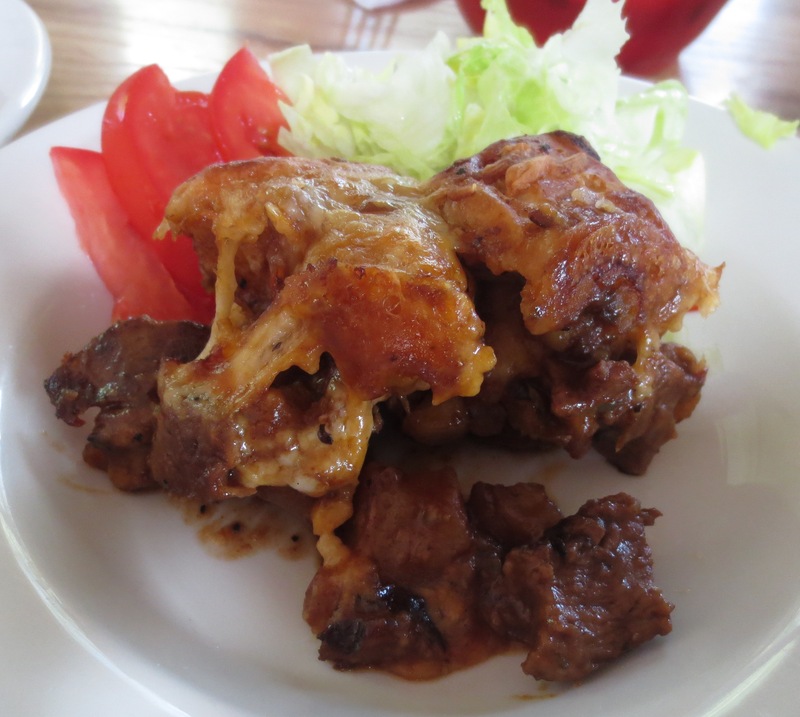 Here are a few random recipes (in no particular order – I’m feeling scattered lately) to share with everyone; nothing fancy, just good tasting comfort dishes mostly. And, uses for leftovers whether from your cooking or what is brought home from a restaurant meal. 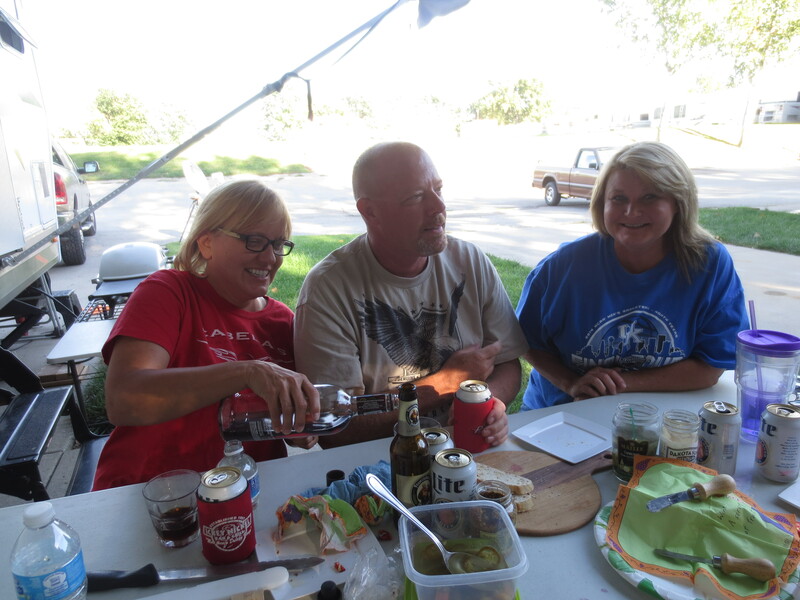 Serendipity played a part in bringing the three sets of travelers together in the RV park in Independence, Missouri yesterday. Lori & Jerry Hansen of San Tan Valley, Arizona on one side of us and Donna & Jim Downey of Auburn, Kentucky on the other and we came together to chat after we were all settled in and that chat lasted until late into the night. We learned so much from their travels (which we have not experienced yet) and I hope we gave them a few insights into ours. 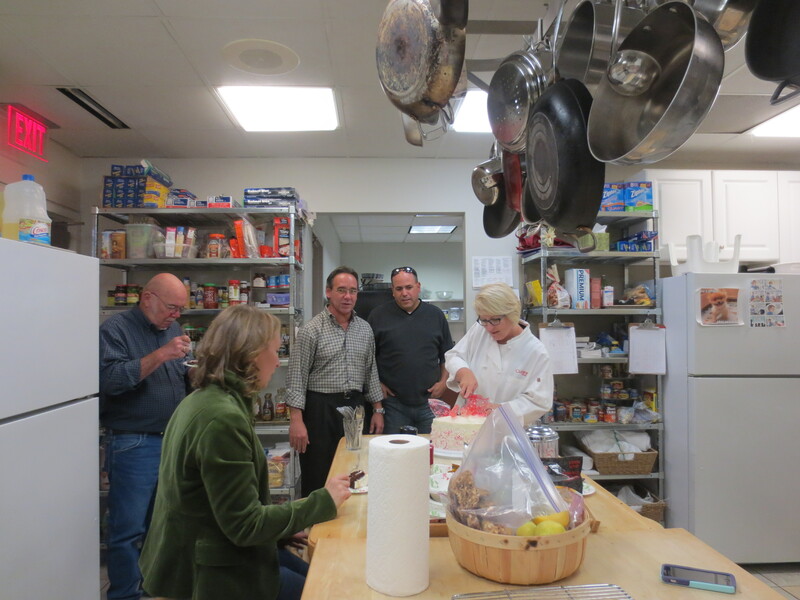 To find 6 folks together with so many common interests – cooking, yakking, drinking, eating – how can we not talk non-stop? It will take me a month to try all the ideas I got from Jim, who grills and smokes and loves to try new dishes he hears about on food shows. Sound like someone you all know?? Surprisingly, both the men had been U.S. Rangers, so it was really interesting listening to their ‘tales’ of Ranger days. 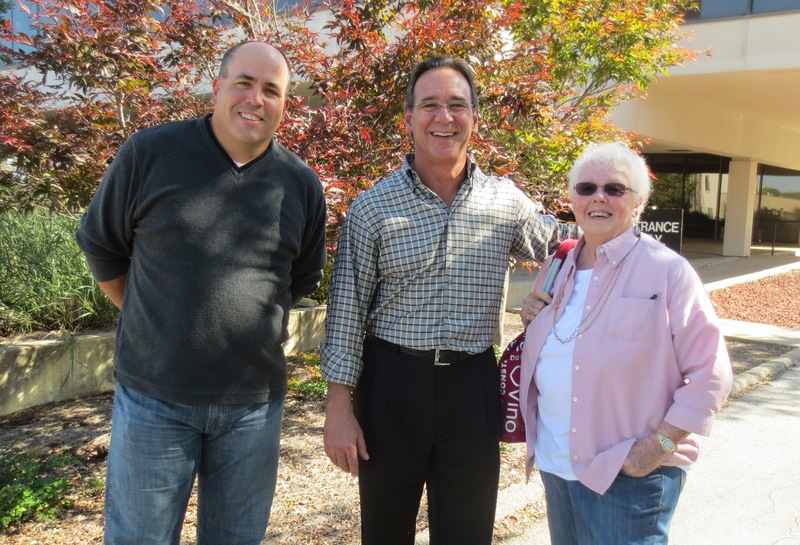 In addition, Jim and Roy were able to reminisce about M113 tanks! Cut an onion in half (between stem ends) without peeling. 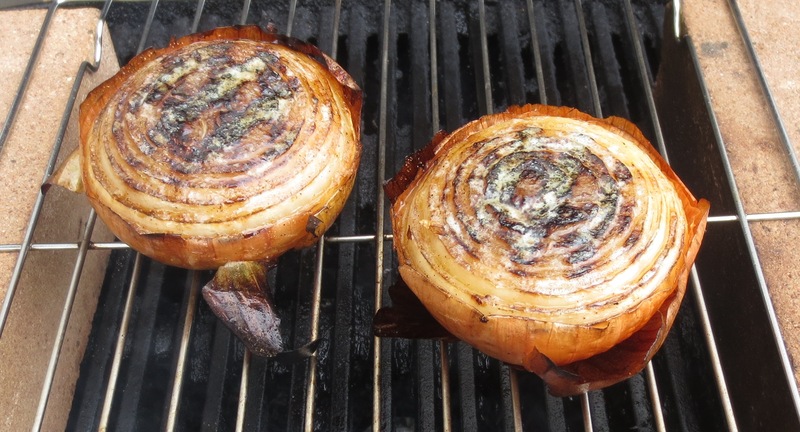 Rub the onion with a little olive oil and grill over medium heat cut side down for about 18-20 minutes until you have a nice char; carefully turn over and position so the cut side of the onion is level on the grill. Top each half with a dollop of butter and sprinkle liberally with Tony’s Chachere’s seasoning (I was a little shy with it and will certainly use more next time). Grill for another 12-15 minutes. 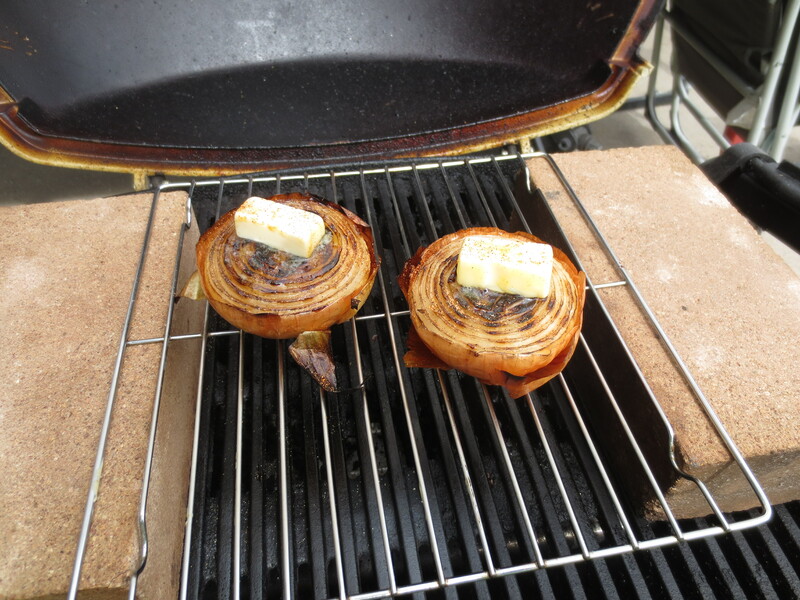 Because I can’t get away from the heat source on my camping grill, I jerry-rigged with my fire bricks and an oven rack and finished the onion after the 12-15 minutes on the rack for an indirect cooking. All in all, the onion was perfectly cooked after a total of 50 minutes. 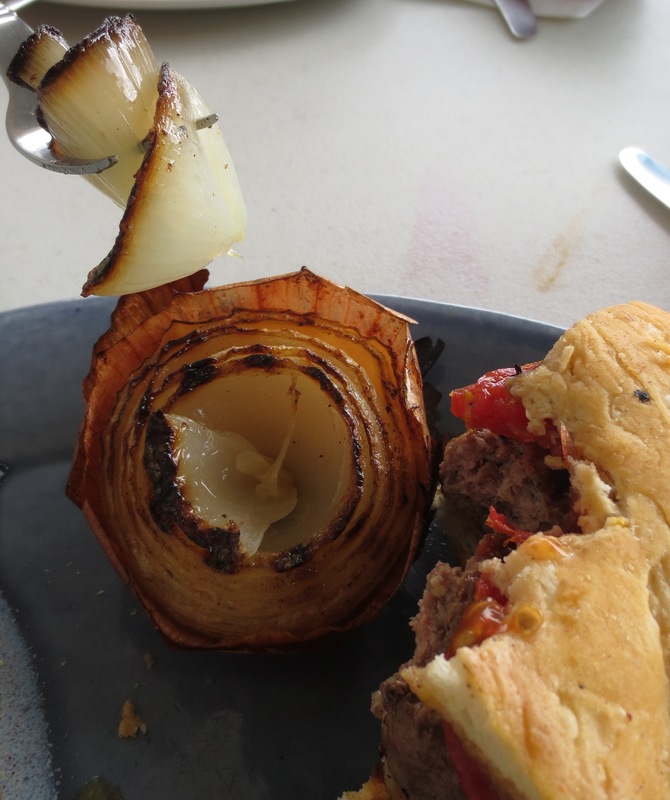 Have to say this was the best grilled onion I (and Roy) had ever tasted. This will be the go to method. I had leftover steak and we’re in Kansas City/Independence, MO, so what better sauce to combine and work with than K.C. Masterpiece BBQ sauce. What a match made in heaven. Garnish: tomato slices shredded lettuce Sauté onions and jalapeno (and leftover potatoes if you have) until onion is soft. Transfer to a large bowl; add the steak and toss with BBQ sauce. 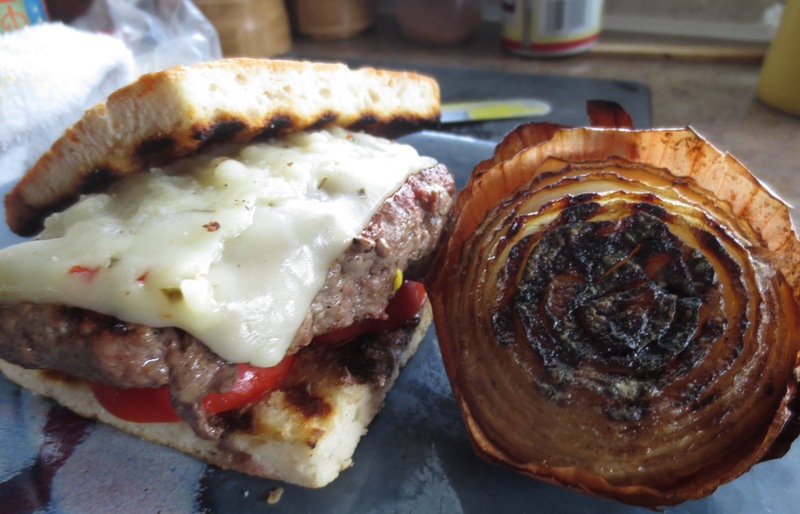 (If you have raw steak, coarsely chop and cook with onions and jalapenos. Remove 3 biscuits from container (save others for baking) and cut each into 8 pieces. Gently toss the biscuit pieces with the beef/BBQ sauce mixture. Spray a casserole dish with cooking spray and dump the beef/biscuit mix into the dish. 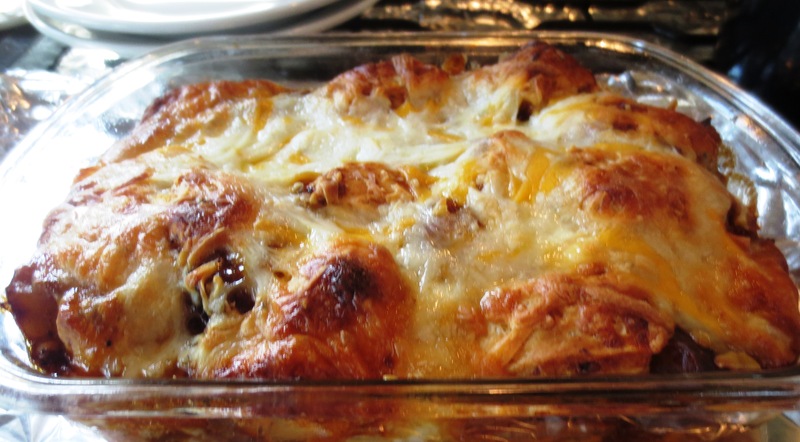 Top with the shredded cheese and bake at 350 for 30 to 40 minutes, making sure the biscuits are cooked thru. Options: Doubling the recipe allows you to use all 8 of the biscuits – use a 9”X13” baking dish for this amount. For a fuller flavor dip, make a demi-glace for dipping the sandwiches – Knorr’s makes a great powdered mix to work with. To use in place of canned broth or consommé: 1/4 cup demi-glace to 1 cup hot water. Allow to simmer 6 minutes, then add ham slices and warm through. In a small bowl, melt butter in the microwave. Add 1 tsp garlic powder and combine. In a large saucepan, combine broth consommé and 1/2 tsp garlic powder; bring to a boil and then reduce heat to low. Place ham into beef consommé and garlic. 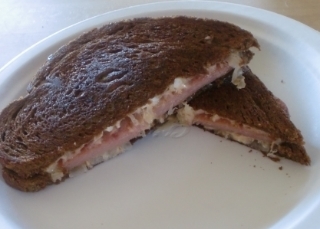 Heat ham for 30-60 seconds, until slightly warm. 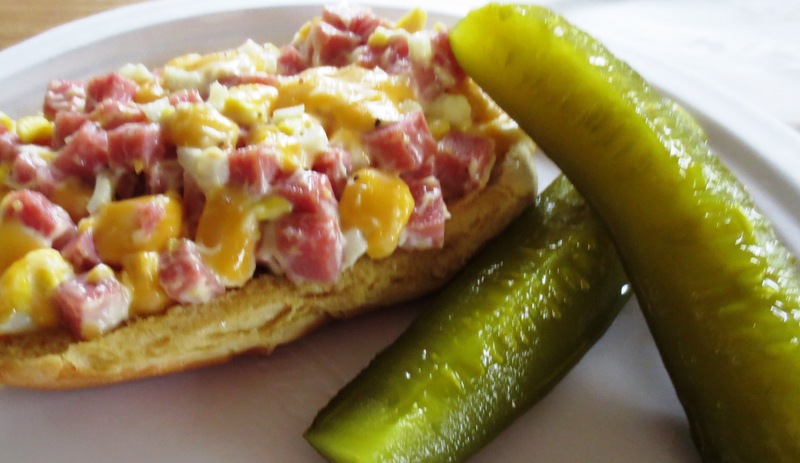 Using tongs, place ham on rolls and top with a slice of onion. Serve sandwiches with remaining broth for dipping. Let the rhubarb mixture cool, the strain it through a wire-mesh strainer set over a large pitcher. Press on the solids to extract as much liquid as possible. Discard the solids. Stir in the lemon juice and soda. Serve over ice, garnished with a sprig of mint. Fill with ice and enjoy. Guess I’d better stop for now – I’m getting hungry! Found The Local Pig Charcuterie, www.thelocalpig.com, a butcher shop with a little ‘shack’ attached at the back called ‘Pigwich Shop’ where they sell sandwiches. Not ready for those yet, so we bypassed and headed to the butcher area and found a windfall of more meat, sausages, charcuterie, etc. than I could possibly choose between. Finally narrowed our purchases down to: a slice each of head cheese & rabbit pate (for a charcuterie platter at home); Burnt ends sausages; ‘rotating pot pies’ savory filled (sausage, potato, gravy, not sure what else) little breakfast bun which we will split and have with lamb bacon (had never heard of or thought of this). Had to stop there! 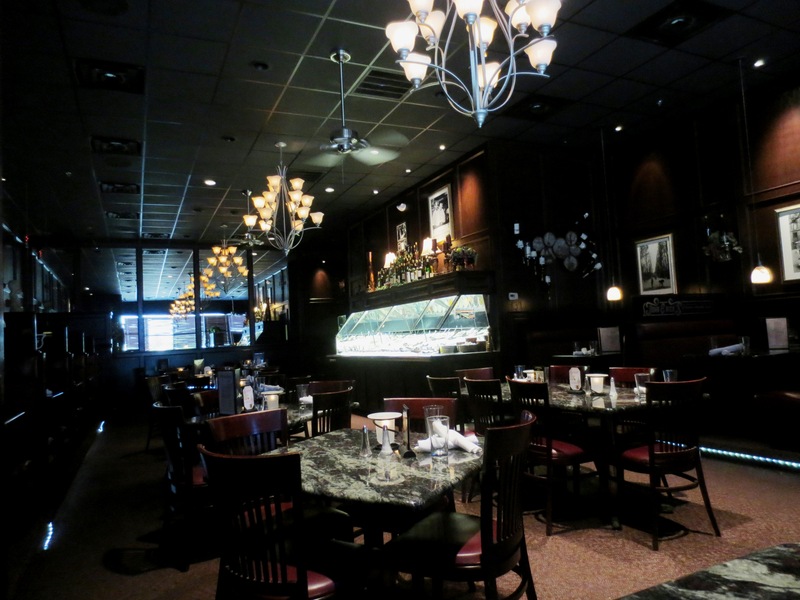 On our lists of stops – next was The Seattle Fish Co. (in Kansas City?? ), but they were not open on weekends, will head there next week. They advertise “If it swims, we have it”. Just take a gander of their roster http://seattlefishkc.com/products.php I’m going to have real trouble with this place. We’d worked up an appetite and figured we could now start foraging for ribs. First stop – McCoy’s Public House, www.mccoyskc.com, found a couple of new wines to try: Dreaming Tree Cab (my choice and it was great) and Black Cabra Malbec (which Roy equally enjoyed). 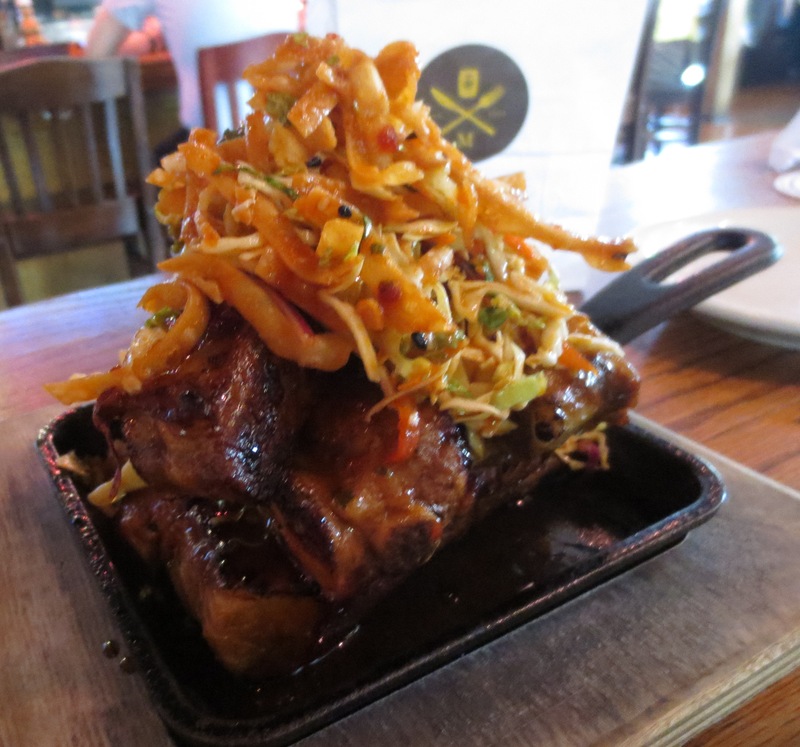 Hoping to allow room in our tummies for a few more stops, we started with an appetizer – Bag of Bones, a pile of Garlic-Chile Honey Boney Spareribs with crispy sesame wonton slaw and a doggy bag. Not the usual doggy bag, but a paper sack to throw our bones in as we cleaned them! The ribs had all the flavors – pungent (acrid) sweet, sour, bitter and salty and were some of the tastiest ribs I’ve ever had; even tho they were not the K.C. ribs we had set out to discover. I was so taken with the crispy wonton slaw that our server, Angel (and she certainly was! ), brought me a container of the slaw and 2 containers of the vinaigrette to bring home to try duplicating. Since our wine taste buds had been awakened, we headed next to Belvoir Winery, http://www.belvoirwinery.com/index.php?cID=52. What a beautiful building and setting for a winery. They are in the process of developing a B & B, if you will, for weddings, conventions, and I’m sure the general public. The wines were surprisingly tasty and with more body than I would have hoped. (must get past the notion we will be hurting for good drinkable wines when we leave the west coast!) P.S. This was the first time we had ever seen hard liquor for sale in a wine tasting room! One of the pourers proclaimed proudly – “We get away with everything in Missouri!” Found out later, Missouri really does; it has the most lenient liquor laws in the U.S.
We stayed at the winery so long talking to a great group of visitors and the ‘pouring’ staff, that it was almost dinner time and we actually found we had room in the tummy for our rib pursuit. 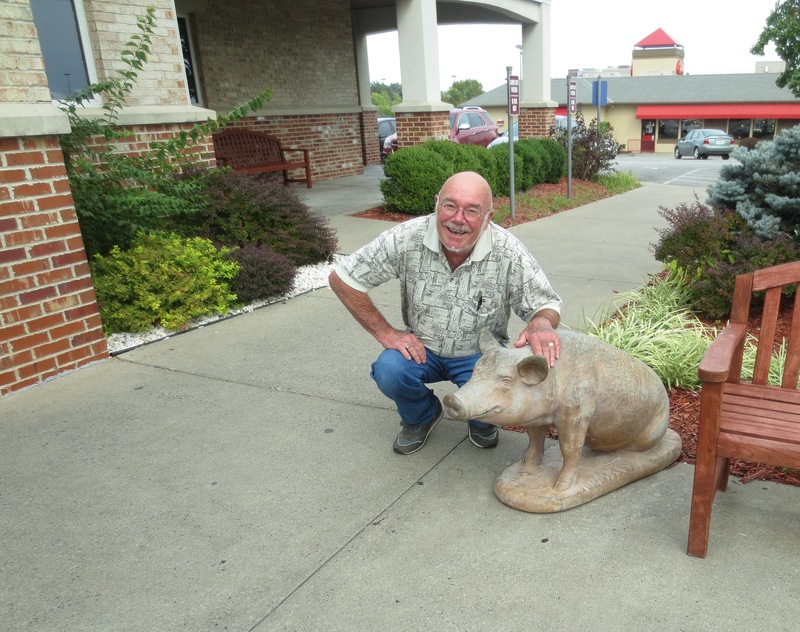 Headed back to Independence to stop at Smokehouse BBQ – heading back was our first mistake! Why didn’t we stay in K.C. and go to a rib ‘joint’ recommended to us by folks we know? Dumb. Our rib platter (beef, pork & chicken) was so bad, we didn’t even eat it! Dry, stringy, tasteless except for the dollop of sauce added last minute. But, I must admit the baked beans were some of the best I’ve had! And, the coleslaw was very tasty, too. Our server, bless his heart, only charged us for our wine & a side of beans. So, we were only out one experience of trying the local fare, which hurts because I want to limit our restaurant stops. We will be eating ‘high off the hog’ so to speak for the next few days and then we’ll go foraging again – we’re here for 2 weeks after all! Where to start with one of the best days of my cooking years! And, I must begin this story with an apology – I should have taken a photographer and a note taker with me because I was like a kid visiting a candy store for the first time. For 90% of you reading this, you’ll probably agree with me that a job in the test kitchen, we would all kill for. If I were 20 years younger, believe me, I’d have my job application in and move to Des Moines in a minute! Because of my awe of all I saw and those I met, I did not make note of names, titles, all the information I should share with you to give them proper credit. 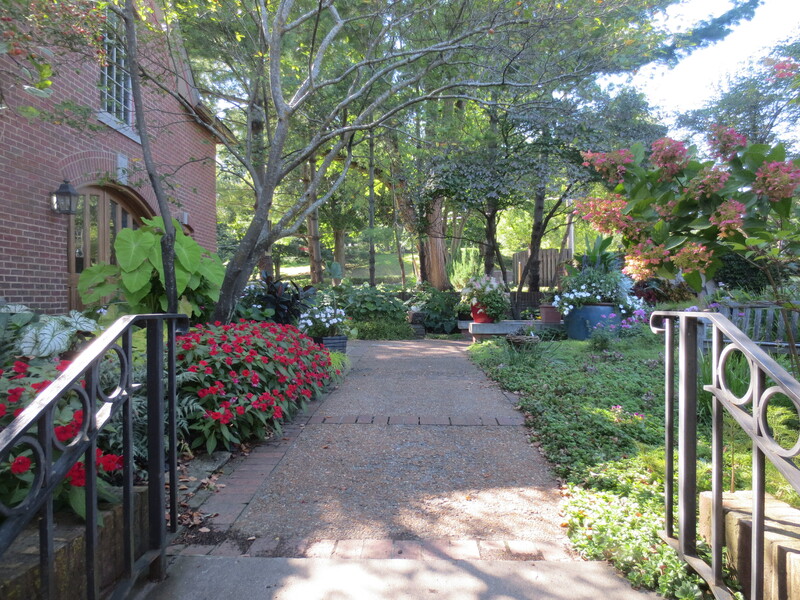 We arrived early and as we were waiting and looking around, a beautiful old building caught our eye – it’s an old carriage house which C@H bought years ago and where the gardens are located. We declined to tour the gardens because the mosquitoes were out in full force and they would have had a feast on me. But, I did manage to get some pictures. 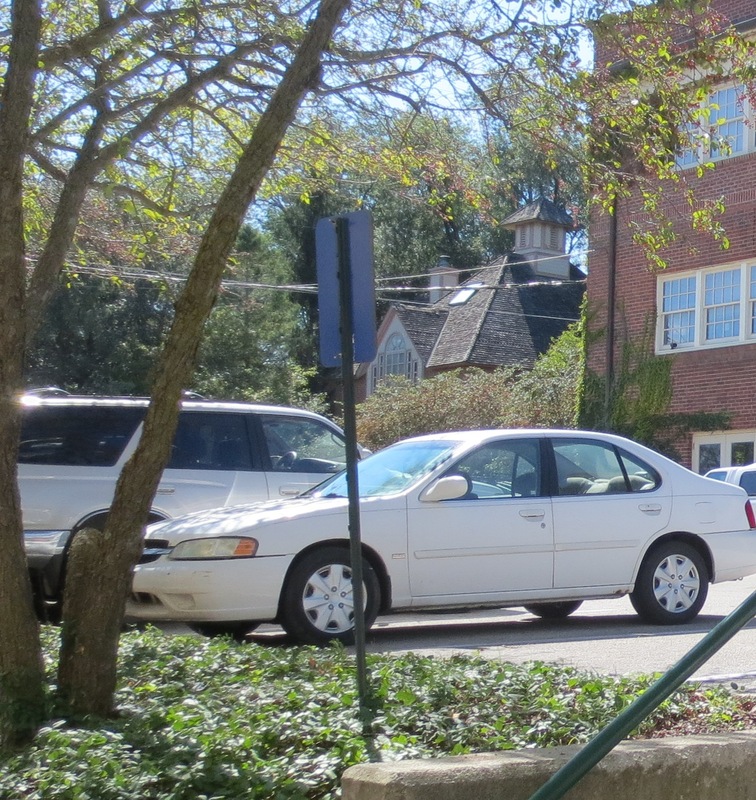 The building in front of the carriage house is the accounting, etc. side of publishing. 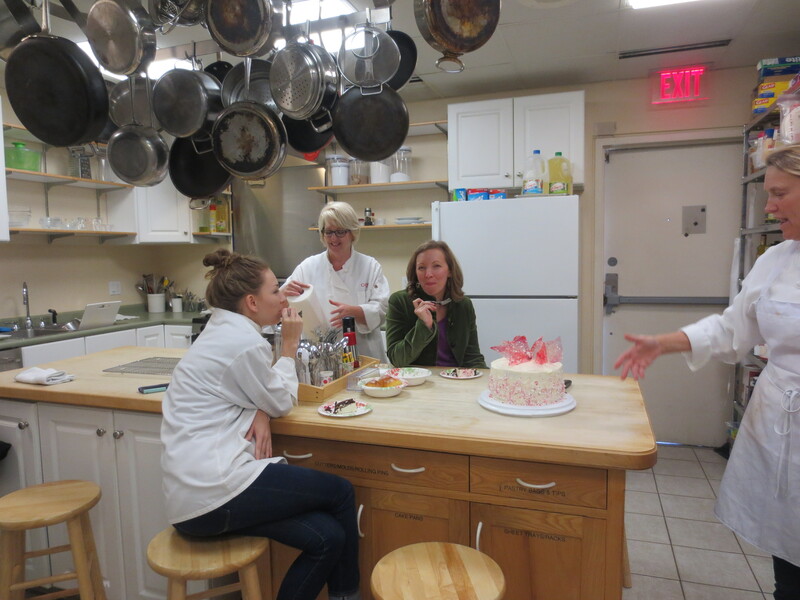 Then on to my favorite part of the visit – the test kitchen and the talented cooks who ‘play’ all day with food and get paid for it! 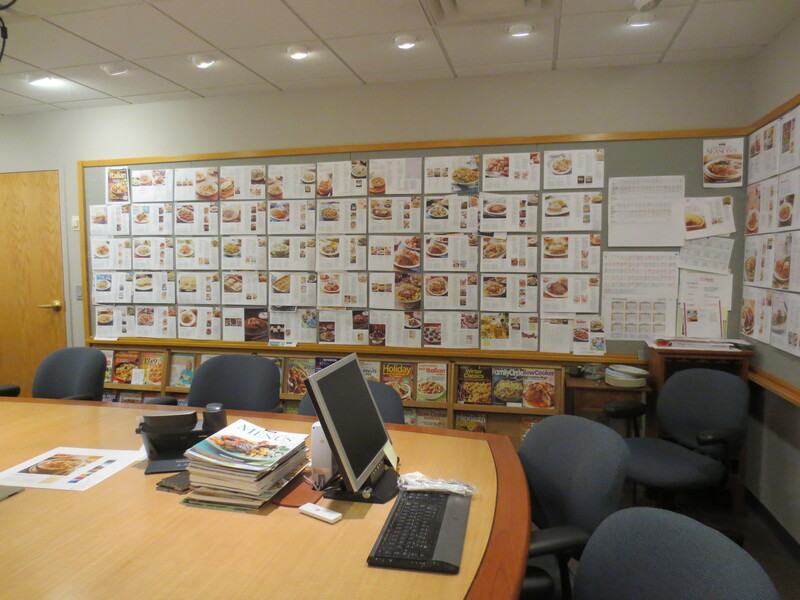 Kim answered all my questions about how things are set up in their area – everyone has their own ‘kitchen’ to work their magic on recipes for each issue. And, they come together to test them. Kim in her ‘kitchen’ cooking bacon – everyone does their own dishes; they don’t have the ‘dish dog’ I have when I’m testing recipes. One of the recipes they are working on for November’s issue is a Chocolate Peppermint cake, which was waiting to be tested/tasted. We were invited to test with them and the cake was a winner – moist and chocolatey. The garnish of candy shards made the cake look so festive (the method will be part of the recipe). Later in the tour we would see the pages on the story board for this cake and the progression of the recipe to what it will look like for publication. See the candy shards on top of the cake? They will not be in the initial picture, but will be added as an alternative garnish for adventurous bakers. 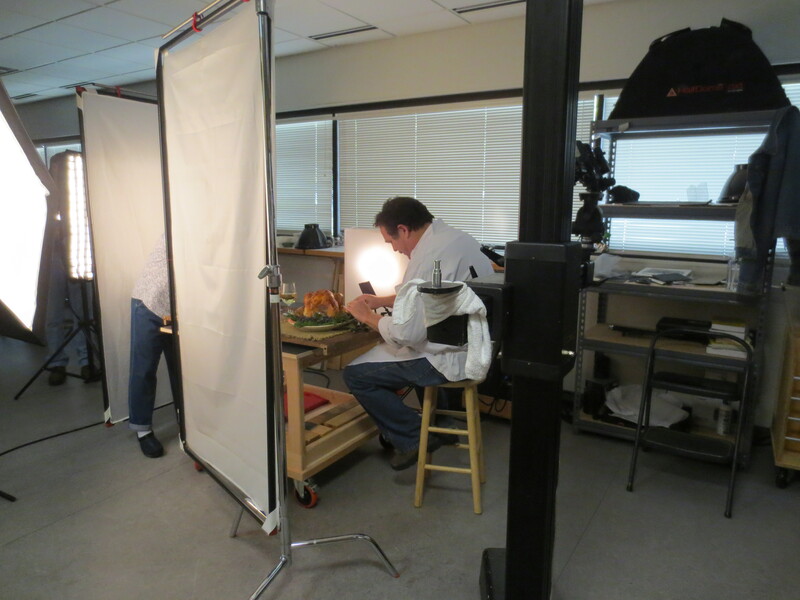 Other areas we walked through – picture taking of the turkey for November’s issue – and what a treat this one will be. They are giving us a new method using a dry brine for the turkey and the stylist is ‘dressing’ the bird for its ShowTime. Another hint about November’s issue – the cranberry recipe; it is combined with goodies that I think we will all want to try – and, not an orange in sight, thank God. Sorry to those who like the combination, but I run from it. Also, looking forward to the new take on Brussels sprouts. We are in for a treat. 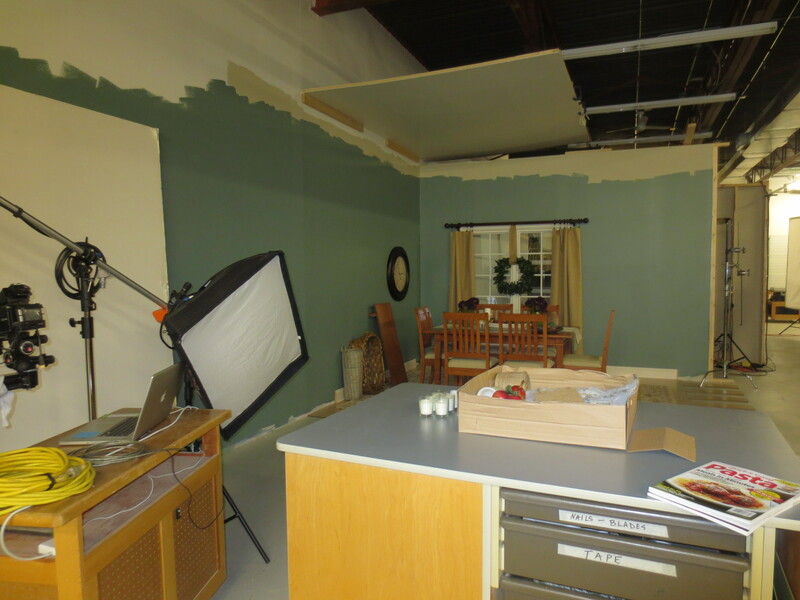 We finally had to leave the food area and check out one more facility – the wood working area. While most of us are fans of the cooking magazine, August Home Publishing offers others – Woodsmith, ShopNotes, Garden Gate, and Workbench magazines, and the Woodsmith Collection of woodworking plan books. 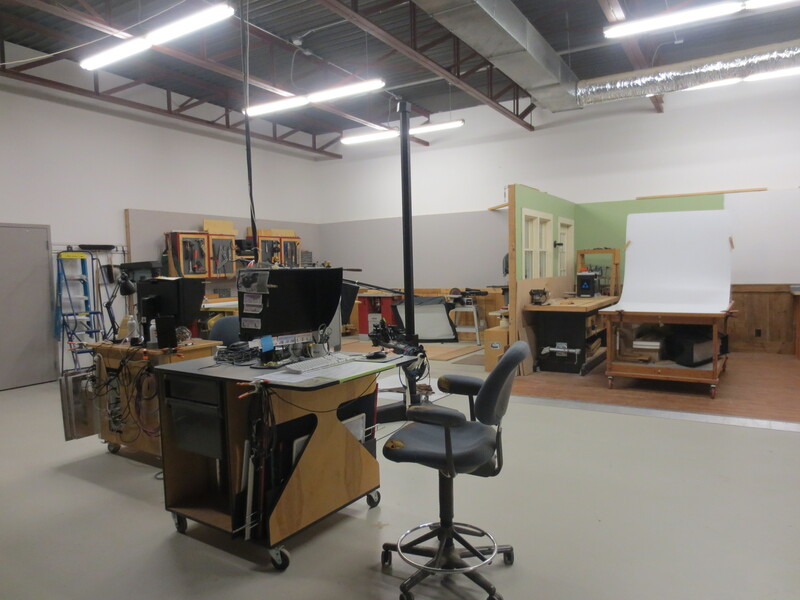 As I knew would happen, it was difficult to get Roy to leave the woodworking areas – believe me, the equipment they have to work and play with could make a grown wood worker cry with envy. Sadly, we had to let Brian, John and everyone get back to ‘work’ and we headed off to have a glass of wine and bask in the joy of our journey around the magazine world. I could not have asked for an afternoon better spent!! Wow! Thank you Brian for putting this together for us and again, I apologize for not taking better notes and pictures instead of being an awe-struck fan. 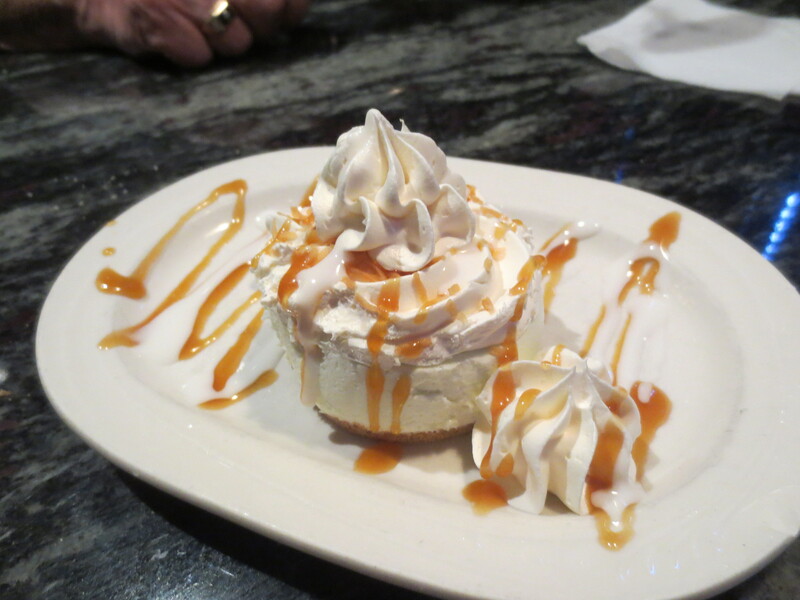 Of course, along with that glass of wine, we had to try the local fare at John & Nick’s Steakhouse – perfectly cooked rib eye and Key Lime pie for dessert. Now, back to the drawing board for me to decide what to do with the leftover steak. And now, on to Kansa City Missouri and RIBS!!!!!!! Finally arrived in a town where we know someone on this cross country trek! My friends Laura and Brad Behrendt and their great kids, Maggie and Joe, live in Rogers, MN. 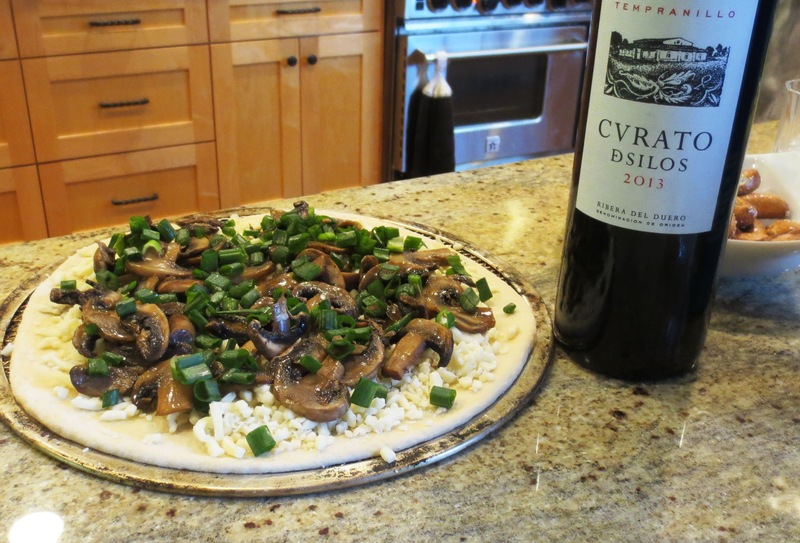 Spent the afternoon and evening talking food, wine, food, kitchen equipment, food and watching Laura prep a pizza dinner….you see where Laura and I are on the food scale – at the top! 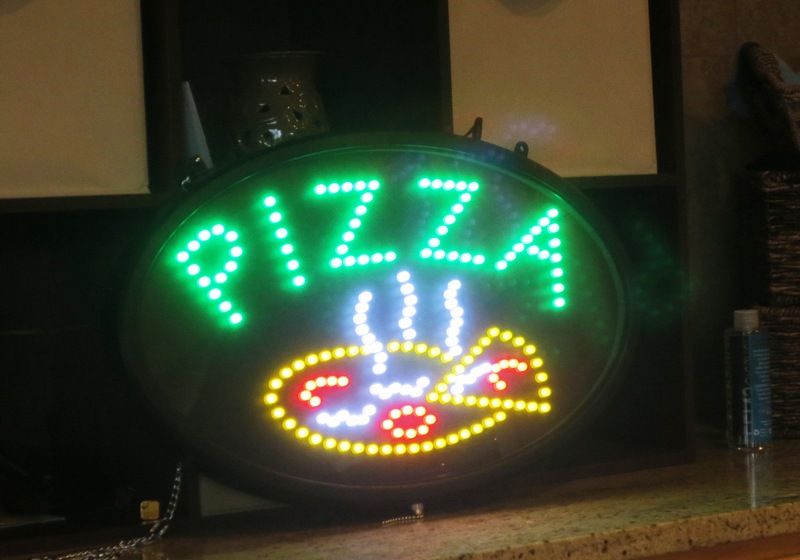 After visiting Larua & Brad, I am so lusting after two pieces of equipment they have – the salamander (in the kitchen pix) and the Kettle pizza cooker. 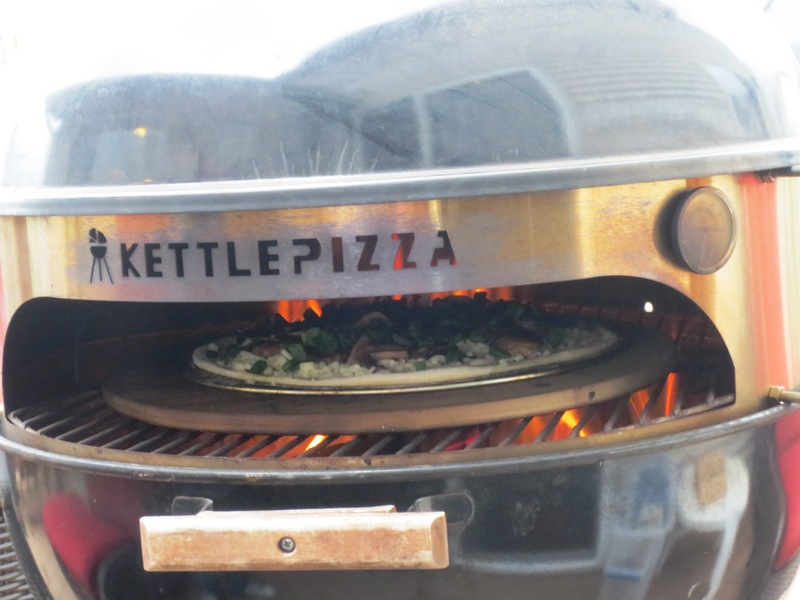 I’m thinking this Kettle is the way to go for us, much less expensive to start with and it does a darn nice job of grilling pizzas. 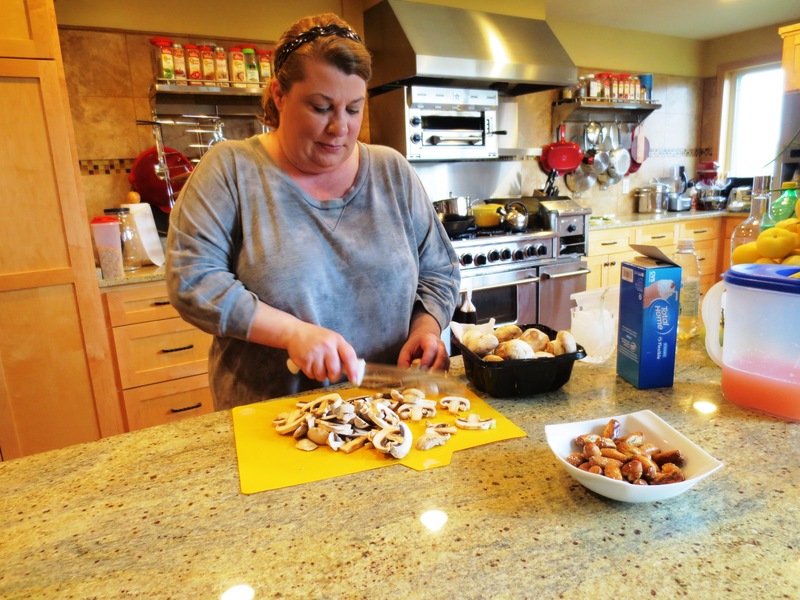 Laura prepped 5 or 6 pizzas and each one was better than the other! Great flavors. 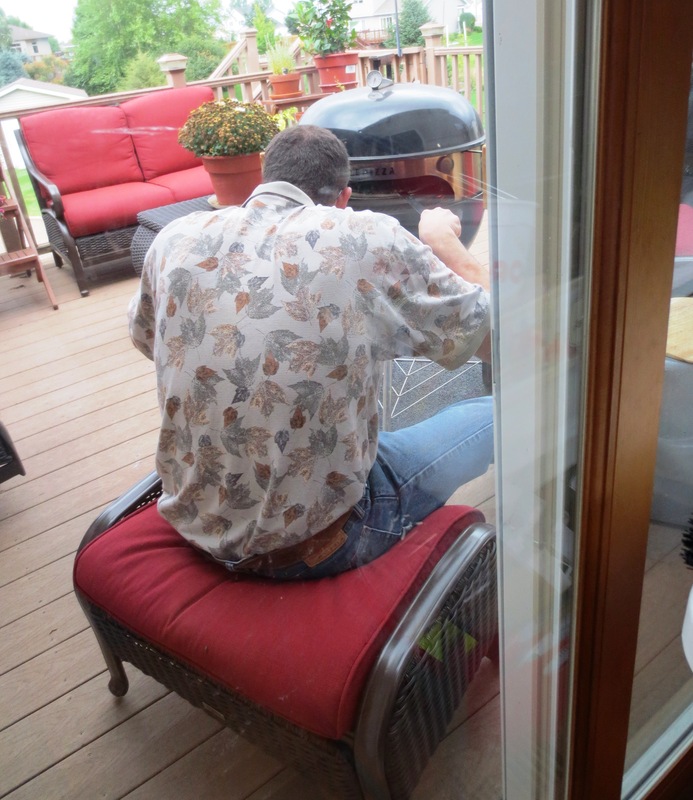 Brad acted as the little old pizza cooker and as you can see, he really gets into his job in comfort! A couple of our pizzas and a good time was had by all! Along with a little wine (Spanish Tempranillo) and Rhubarb Lemonade, that we’d never tasted before, but will be making them now!! And, she sent me home with a goodies bag of her garden goodies she has been preserving – all look darn good to me – now, to decide what to use first. Yellow Heirloom Salsa – bound to be a sauce for slow cooking short ribs for some wonderful tacos. Yellow Heirloom spaghetti sauce – destined for lunch today over Campanelle and a couple of garnishes. 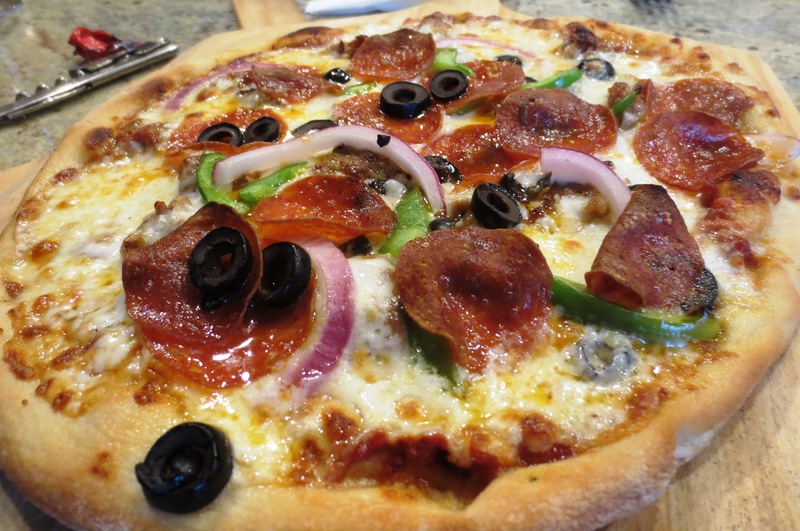 Heirloom Pizza/Spaghetti Sauce – looking for my pizza dough to get busy with this one. Supposed to rain today, so she has a great prime rib dinner planned with a surprise local dessert. Stay tuned………. This was such a spectacular result it deserves a blog entry of its own! At the Walker, MN farmers market a few days ago a vendor was selling pkg. dips – desert and savory. One caught my eye, Lemon Cheesecake Cheeseball & Desert Mix and just from the picture, I bought it with no idea what I’d do with it. Before I got home, I knew what I was going to do. Being in the travel trailer with very little room in the freezer, I have never been able to make ice cream. But, with light bulbs exploding in my mind, I grabbed my little hunk of leftover cream cheese while Roy hit the road for the nearest Dairy Queen. Mixed up 1/2 the pkg. 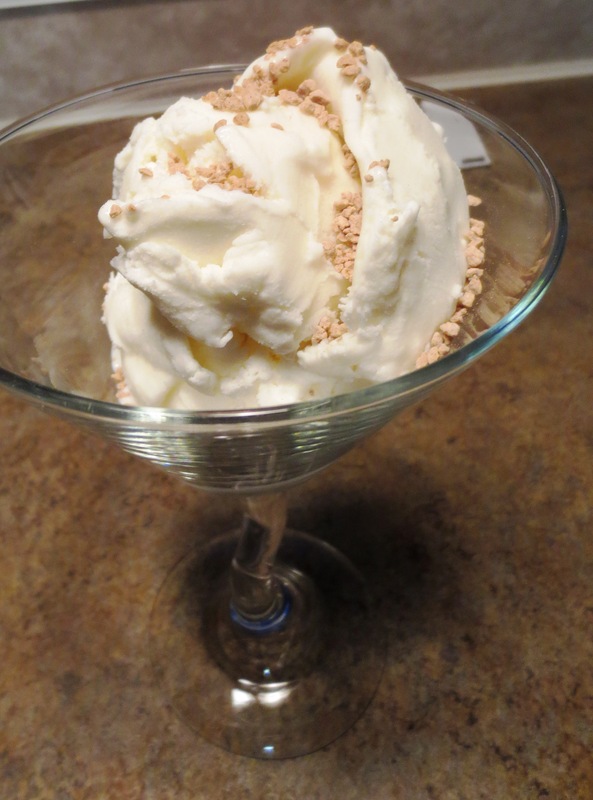 of mix with the softened cream cheese and when Roy walked in the door, I added the pint of soft ice cream to the mix; froze it and waited very impatiently for it to harden enough to dig in. Almost every town we hit has a Dairy Queen and a pint is only $1.99. And, Dairy Queen is lower fat than regular ice creamWhat a decision as to what flavor next….Huckleberry, Chokecherry, CHOCOLATE! To me, this is a win win situation – and the same day one of the wines we picked up from Forestedge Winery, also in Walker, MN – Black Currant, was wonderful with the ice cream. “It was a dark and stormy night……’ in Walker, MN, but God stepped in and made it al fine! What a fun day this was. After “It was a dark and stormy night” of lightening, thunder and pounding rain (a town near here got 1” in 5 min.) 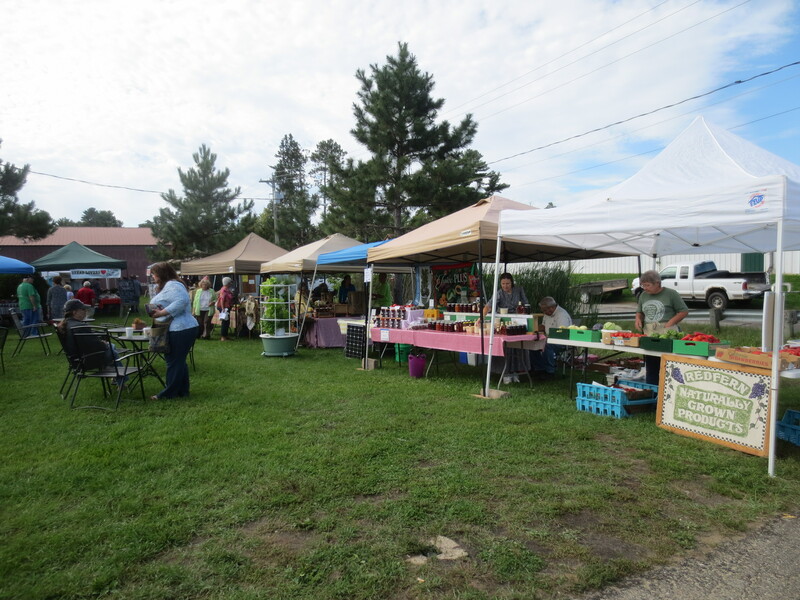 – the morning turned beautiful and off we went to the Walker Farmers market. So many friendly, knowledgeable vendors. Except one who thought Minnesota could raise better Walla Wallas than Washington!! 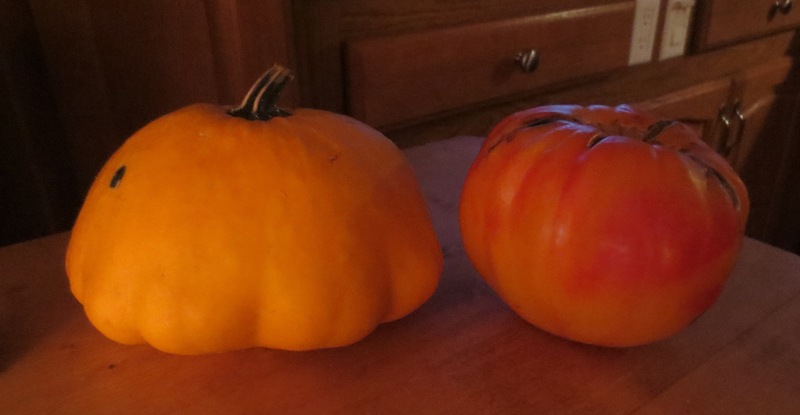 Bought lots of veggies – patty pan squash, huge Daikon (probably roast with onions and ?) and have with a grilled steak. Plums & peaches for just having some fruit, a loaf of sourdough bread and 2 more jars of Chokecherry jelly to play with. A container of Canola (not the oil!) honey – it’s white and looks like the honey we used to get in waxed cardboard containers when I was a kid – tasted of honeycomb. A lb. 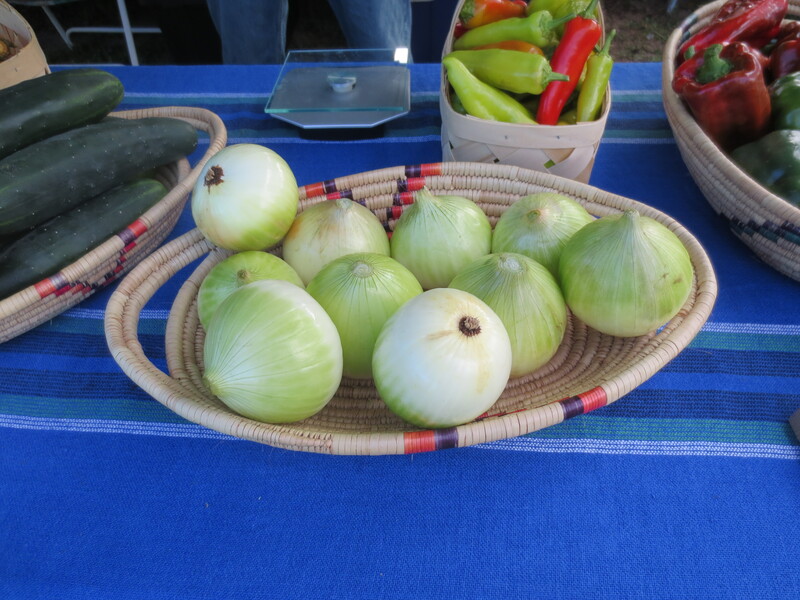 of tomatillos – so pretty, but have no idea what I’ll do with them. 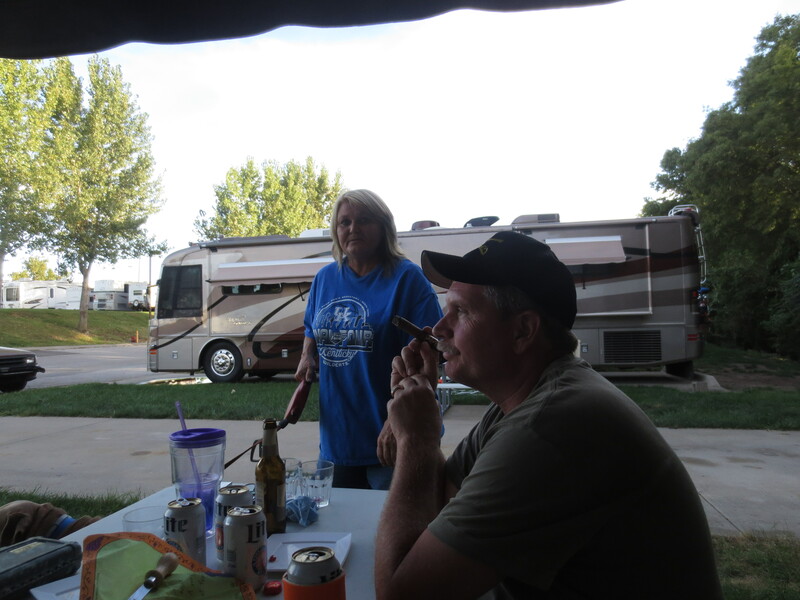 A few Jalapenos, 2 ears of corn and lettuce all of which will ensure no scurvy in our travel trailer. Also, met a delightful lady, Kathy Connell, who is a fantastic local gardener and gives seminars on growing/planting/preserving seeds/all related to this ‘genre’. I bought a Ruby Gold huge Heirloom to used on a Burger in the next day or so – it’s beautiful. Denise Fennell, you especially would enjoy ‘talking’ with her – she is so knowledgeable. There is a cute little ‘tourist trap’ store, Christmas Point Wild Rice in Walker, that had loads of consumables (only thing I’m allowed to buy…) – a red pepper sauce (for pizza), a pkg. of Wind & Willow Lemon Cheesecake Cheeseball & Dessert Mix. Wow, is this tasty – they had it mixed with cream cheese and butter and I’m thinking mixed with a little D.Q. soft ice cream and I can pretend I made cream cheese ice cream of a few years ago. http://www.christmaspoint.com/our-story.html (Christmas Point Wild Rice) – great store with lots of goodies that can be ordered. We usually pooh-pooh fruit wine wineries, but Forestedge is outstanding. We have a 1 bottle rule per winery – we bought 6 bottles – Cassis Pommes, Apple Wine, Black Currant, White Cranberry, Chokecherry and Rhubarb!! 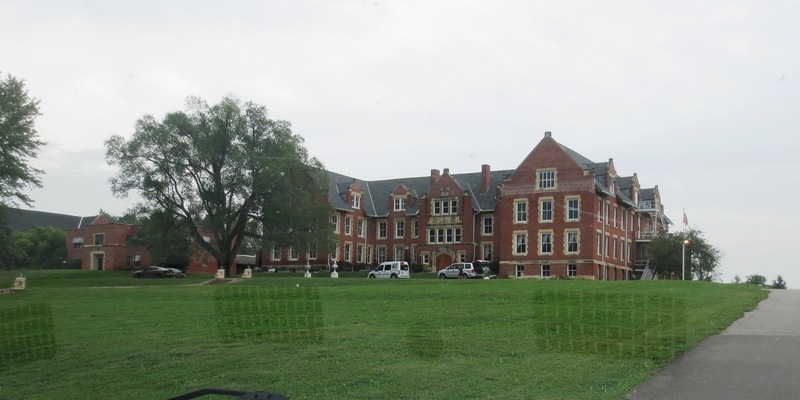 It’s owned by a couple, Paul & Sharon Shuster and John Wildmo. Sharon is the winemaker and she is just excellent at her craft. We all chatted (a couple staying in the same RV park joined us) – the six of us for at least an hour and a half. It was “Meat Raffle Thursday” whatever that means – but, the appies were half off. So we loaded up again so we could bring some goodies home. 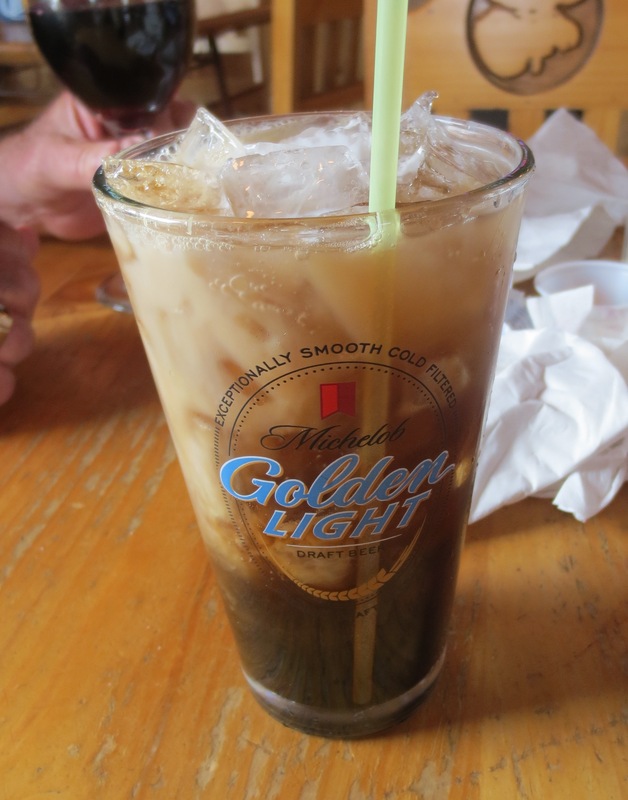 They also have a special drink – Colorado Bulldog: Kahula, Vokda, Coke, 1/2 & 1/2. We split one to end the lunch and is it ever good!! While we were there a regular came in with a jar of pickles to share with his friends at the bar. He told everyone they had a secret ingredient and he wasn’t going to tell them what it was. I had our server call him over to our table and told him we were out of state and wouldn’t tell a soul (except the world on facebook & C@H) if he would tell me his secret. His secret is a pinch of cinnamon (just the tiniest bit) and a larger pinch of powder ginger. There was a little different flavor to the pickles, but you sure could not tell what it was – they were delicious. Now, here comes the personal and sad part of my tale. As he was coming over to our table you noticed he walked with difficulty with a cane and his face had a lot so stuff going on and especially with his eyes, like it was hard for him to focus. After we talked for a while, he told us what had happened to him. He used to be a cook at this Grill and a few years ago he was crossing the highway (out front of the restaurant) and was hit by a car. He was told he would be a paraphaligic (sorry, have no idea how to spell this and spell check can’t figure out what I mean) – but, he can now get around. Roy and I looked at each other and we both just shivered and almost ended up in tears. Years ago, our favorite in the world son-in-law, Larry (Tracie’s husband and father of our grandkids Jimmy & Mandy) was crossing Highway 101 in Sunny Valley, OR going home from his job as a cook at a restaurant on the other side. He was hit by a truck and killed instantly. Can you imagine what went thru our bodies when we heard this fellow’s story???????? After he had gone back to where he was sitting and we collected ourselves, I walked over and sat next to him and told him Larry’s story and how lucky he was to be alive and oh, how we wish Larry could have had the same luck. What a beautiful little guy he was and he ended up with tears in his eyes also. Jesus, what an emotional lunch that was!!! And, that was our day exploring Walker, MN.